This is Jim again. 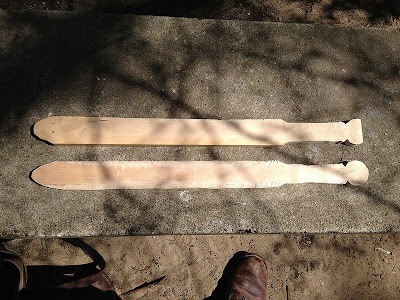 I know last time I said if my wife ("Wood") didn't post here I was changing the name of this part of the blog from Woodcraft to Jimcraft, but (not only does that sound incredibly stupid) this week I'm writing about actual woodcraft, so the name is sticking. For now. A few weeks ago I was in my dad's auto body shop looking at some of the woodworking he's been doing. 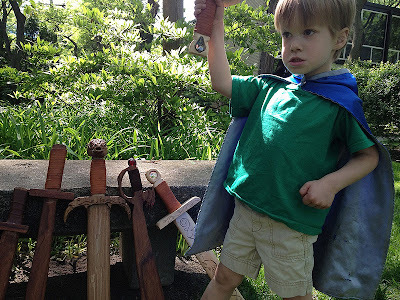 He and my mom have been working on some wooden art projects in their retirement that I will write more about soon, but on this day I asked if we could make some quick swords for the kids to go with their leather knight/elf costumes. The swords I'd bought from an etsy seller were the one part of the costumes they were really disappointed with; the etsy seller used "furniture-grade white pine" and the swords were very beautiful but horrible for play. 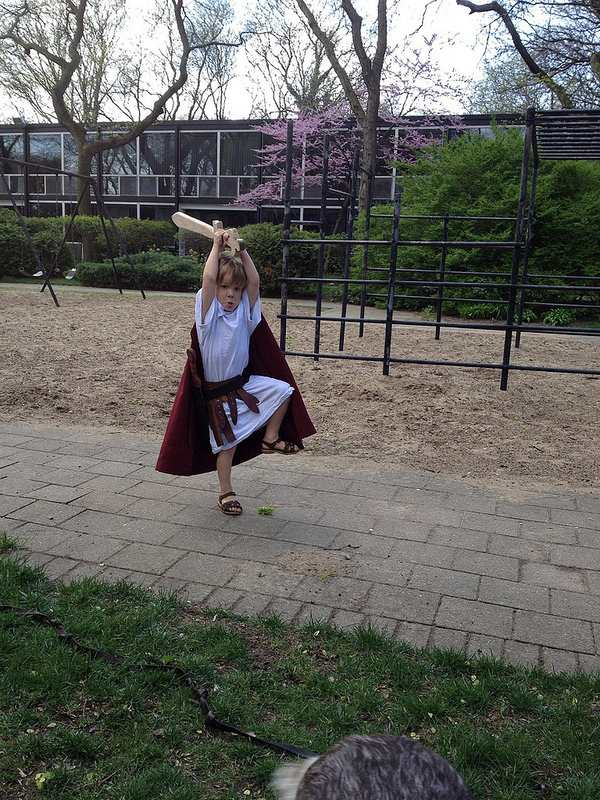 The wood was so soft that the slightest strike created a huge dent and the kids always felt like their swords were going to break. Personally, I think kids who want to play with wooden swords should actually be able to play with them. I've never done any woodworking before, so my dad taught me how to use all of his incredible equipment. He showed me how to use his huge bandsaws and belt sanders and even his smaller hand tools, including files and rasps. In about an hour we made two small swords: an elf dagger for my daughter and a Roman gladius for my son. Both were made from scrap mahogany. 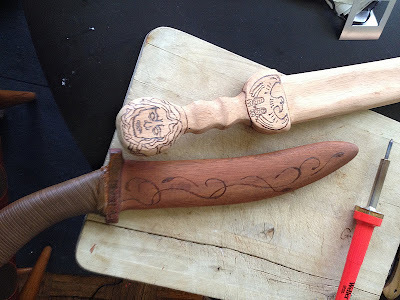 When I got back home I used that cheap woodburner to draw some pictures on the swords, and then I finished them (the dagger is finished in the picture above). I really enjoyed working with the wood, and I wanted to get some of my own equipment right away. Even though I could tell I was about to go overboard all over again, I found a $40 Delta scroll saw on craigslist and bought some Japanese rasps and files and started buying junk hardwoods at the architectural salvage warehouse in town. 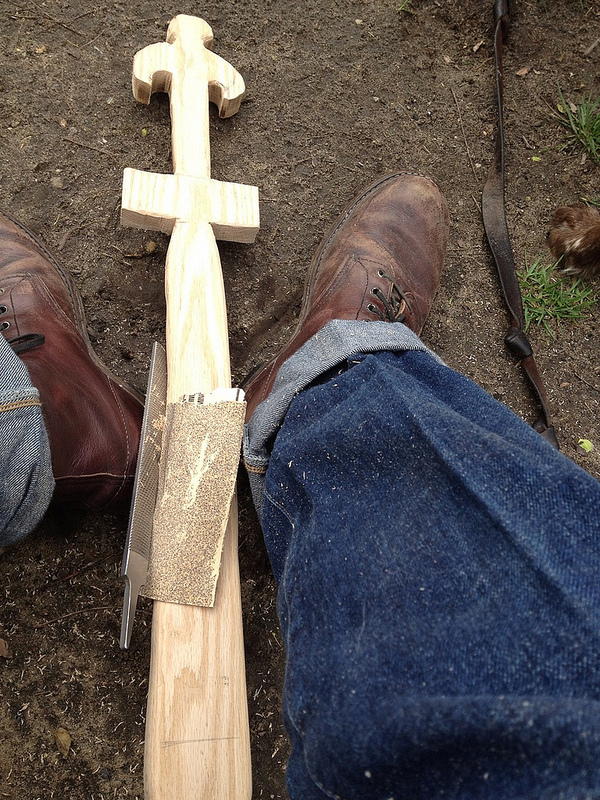 Then I just started making swords. The first one was terrible. I used a big piece of red oak that was difficult to cut and I accidentally made it way too skinny right above the hilt. 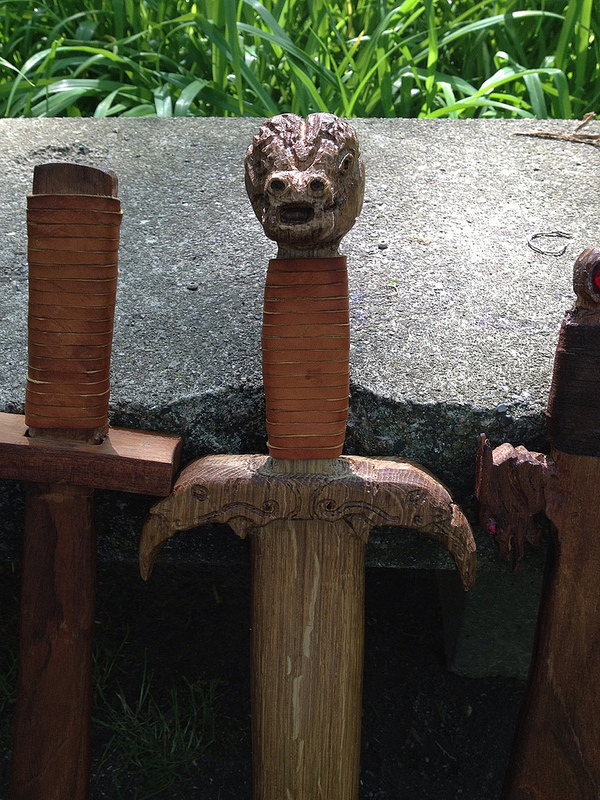 Still, I managed to cut the hilt in the shape of a dragon with spread wings and didn't cut off any of my own fingers. So I set to work smoothing the edges with rasps and sandpaper, which is a super inefficient way to do it (a belt sander is way easier) but this way I was able to work on the sword outdoors while the kids played at the playground. 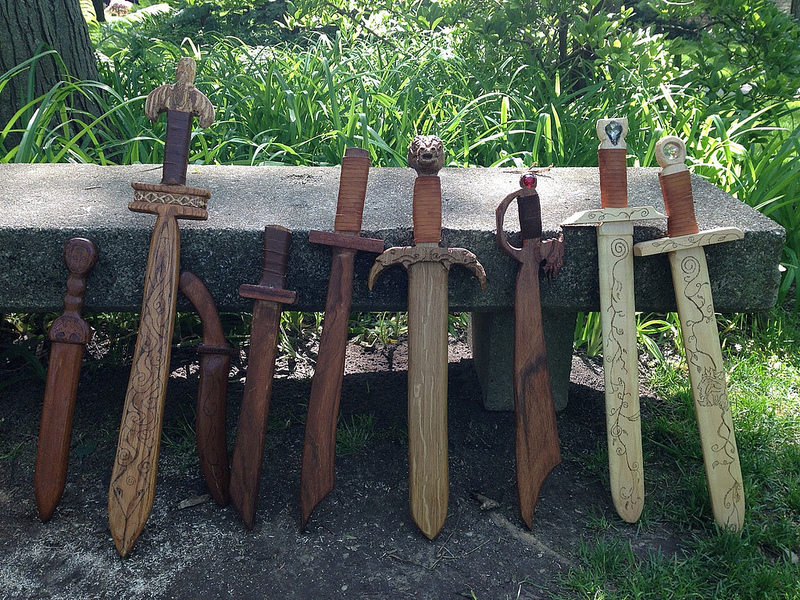 In fact, other than the initial cutting, I was able to do all the work on these swords outdoors while my kids played at the playground. I asked the kids to draw me the kinds of swords they wanted and I tried to make swords that matched their expectations. 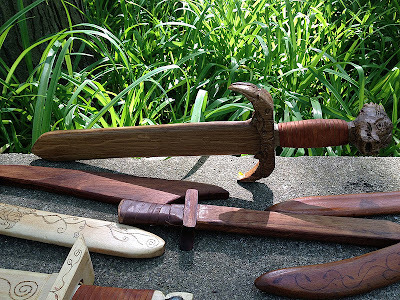 I made a few basic swords out of a piece of walnut and got the hang of the equipment and process. After the third sword I was pretty addicted. Then I found a nice piece of salvaged maple from the warehouse and made two swords from it. The top one is how it looked right after the saw, and the bottom has just started getting shaped with a rough rasp. I think that's his favorite sword I've made so far. We can have swordfights with lots of blade clashing and they hardly get dinged at all. So much better than pine. After the first few swords, I decided not to finish the wood with anything other than boiled linseed oil. The wood I was using was so beautiful on its own, I didn't want to mess with it. 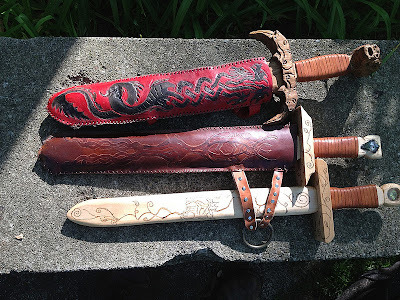 My favorite sword is the one the kids designed and called "Dragon's Claw," with the head of a dragon for a pommel and sharp dragon claws on the hilt. My dad gave me some beautiful scraps of exotic wood and I made this from what I think is zebrawood. The grain is so cool and it was so much fun learning how to carve it. 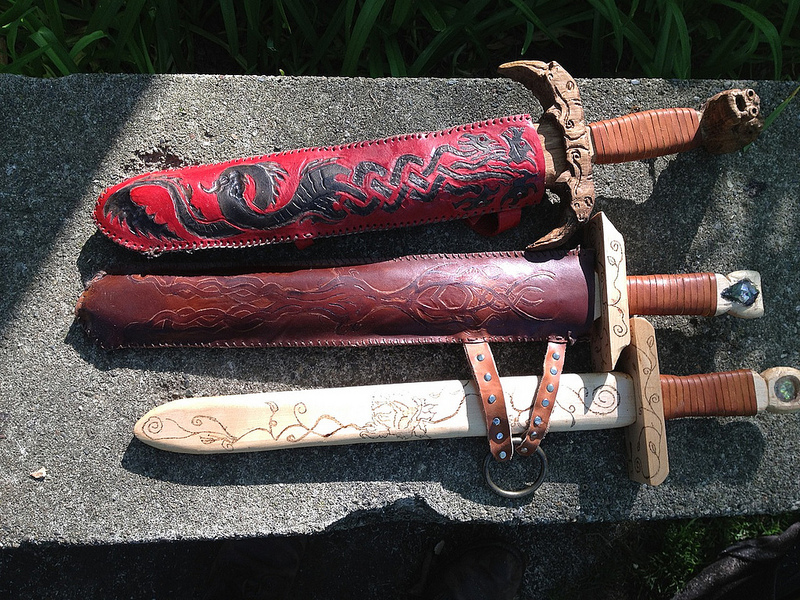 I used leather lace for the handles of all the swords. 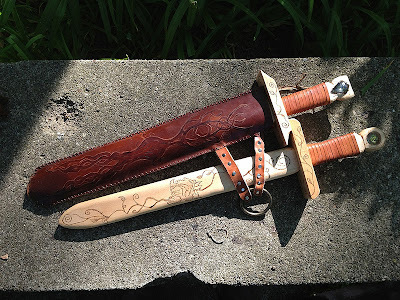 I made a scabbard to go with Dragon's Claw with a hydra design carved in it, but I don't really like how they look together, so I might make another scabbard for it. 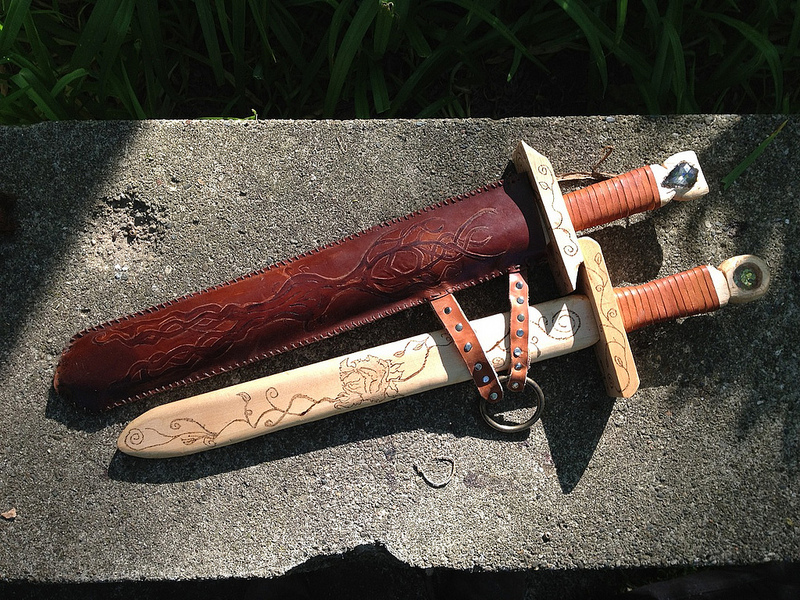 None of the other swords fit the hydra scabbard, so that probably means I have to make another sword. Oops! After that, I guess I'd better get to work on some shields. I freaking love my job.